Columnar, cane-like small trees well suited for low light. Dracaenas leaves leaves grow on erect woody stems with a leafy crown. The leaves are somewhat leathery. Columnar, cane-like small trees well-suited for low light. With leaves that grow on erect woody stems with a leafy crown, the leaves are somewhat leathery. 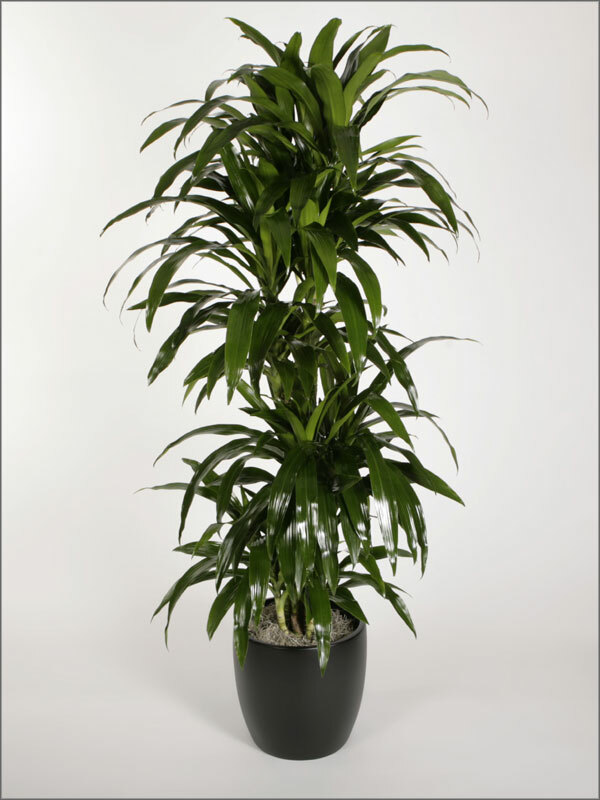 The wide variety of styles and types demonstrate the diversity and versatility of the Dracaenas. 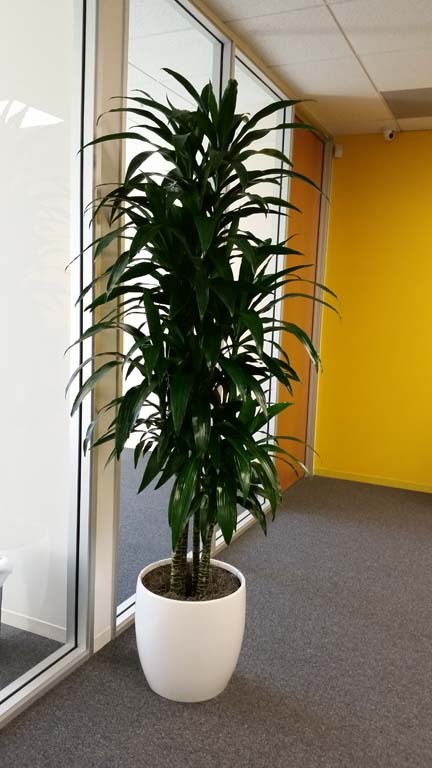 It would be a rare interiorscape account that didn’t include at least one plant from the Dracaena group for they are truly a collection of plants that have adapted well to life indoors. Low light levels to 50fc. Most of them can withstand sustained low light levels, with ‘Janet Craig’ being the most tolerant. 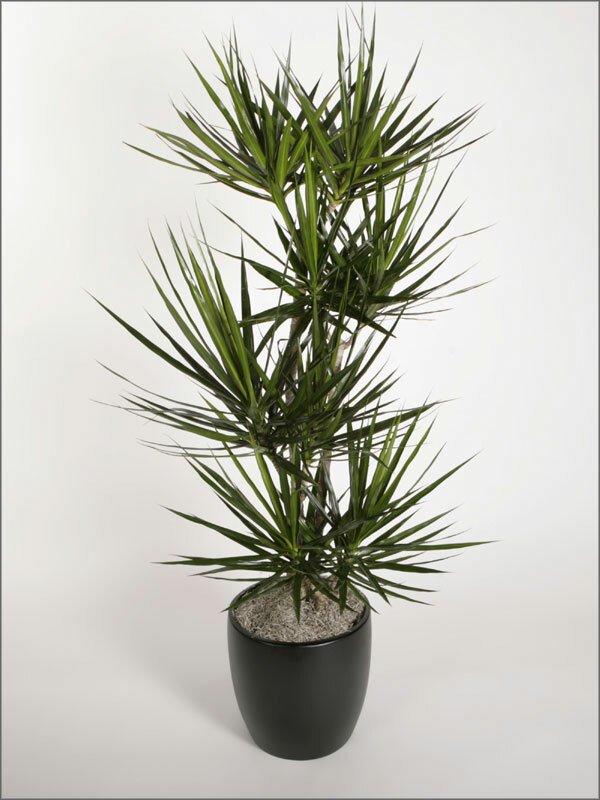 All Dracaenas can acclimate to live in low light conditions. To do this they make several visible adjustments over time. 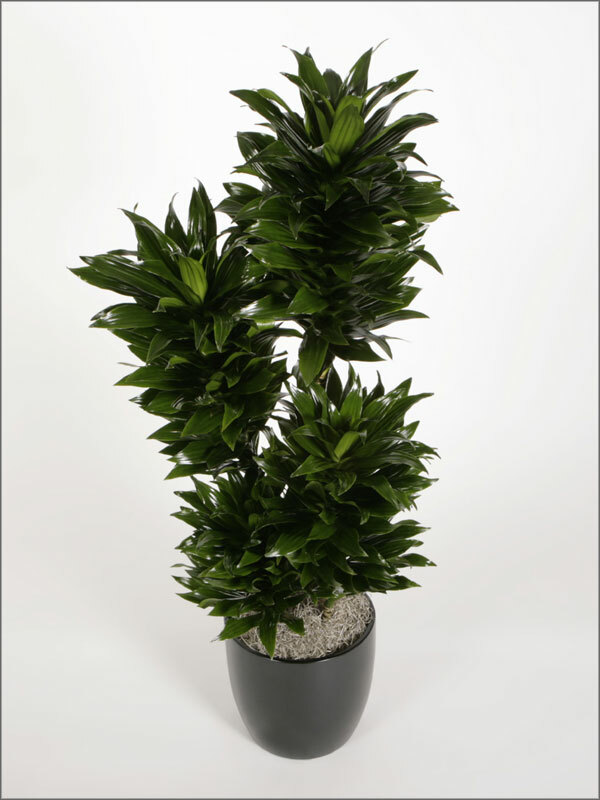 The stiff, thick, upright foliage of a D. marginata will be replaced with softer, narrower pendulous leaves as the years go by. The striped leaf variegation of the D. f. massangeana will become increasingly less variegated. In addition, the leaves will become thinner and more elongated and the canes will get narrower. 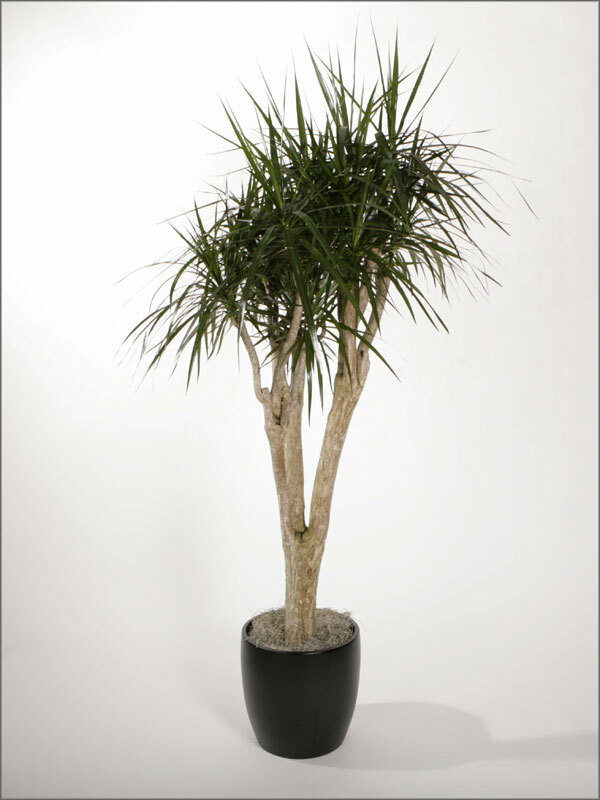 Dracaenas need a slightly, yet constantly, moist medium. They are the group of plants the term “moderately moist” was invented for. Never too wet or too dry, is the rule to live by. Watch for the signs of overwatering with yellow leaf tips that appear wet looking perhaps ringed with brown. Additionally, pale new growth, and root and stem rot are also signs of chronic overwatering. Conversely, underwatering signs are wavy leaves, banana-yellow older growth, and crispy brown tips. “Corking” (bumpy burst cells along the leaves) especially noticeable on D. d. ‘Warneckii is a sure sign of the too wet, too dry cycle. Overwatering symptoms include yellow tips, root rot and pale new growth with brown tips. Canes will develop stem rot and feel mushy, with an unpleasant odour. Underwatering symptoms include droopy foliage and brown tips. Older leaves turn yellow, then brown and fall off; canes lean out of pot. While new growth is pale and droopy. Because of the shallow root system of these plants, it is especially important to gently lay the water evenly around the edge of the grow pot. Avoid dumping it all in one spot. Many of the working roots are near the surface of the soil and will benefit from this light application of water. Sprinkle water carefully and avoid pouring so much as to leave any in the saucer. New canes are sometimes under rooted and roots are damaged easily. Allow media to dry sufficiently before watering. To keep them healthy and clean, wash or wipe the leaves (both sides) using mild soap and water. Use baby wipes or tube socks for a quick wipe down. If these come away with a yellowish tint, mites are present on the plant. Dracaenas like to be a bit tight in their shoes (close to pot bound). This helps avoid potential overwatering problems. If you see spots/blotches showing up on an old plant’s new growth, it is sending out signals that it needs to have soil added. It probably also has some roots circling outside the pot. Cut off these roots and add soil. The easiest thing to do is pop the plant out of its grow pot and add an inch of fresh soil, following up with an inch of new soil on top of the root ball too. Adding a bit of soil to the surface on a yearly basis can help prevent this type of new growth spotting. D. marginatas have a way of “eating” soil through the years and can leave huge holes or air pockets. Leaf damage will result. Punch down the soil on old D. marginatas; you may be surprised by how much air space is below the surface. Fill in with fresh soil. These plants rarely bloom indoors. The bloom is pleasant smelling, but very sticky. It’s best to remove any flower spikes before they open. Refoliate leggy, thin plants by cutting back bare stems and sticking these cuttings into the soil mass. Spider mites, mealybug, thrips and yes, even Cyclamen mites are pests of the Dracaenas. You will need to watch for them, or their damage, and be persistent to eliminate the pest population. Spray with soap and water.